Tanghulu is one of the most traditional Chinese snacks in history. The taste is sour hawthorn and sweet, crispy sugar cover. 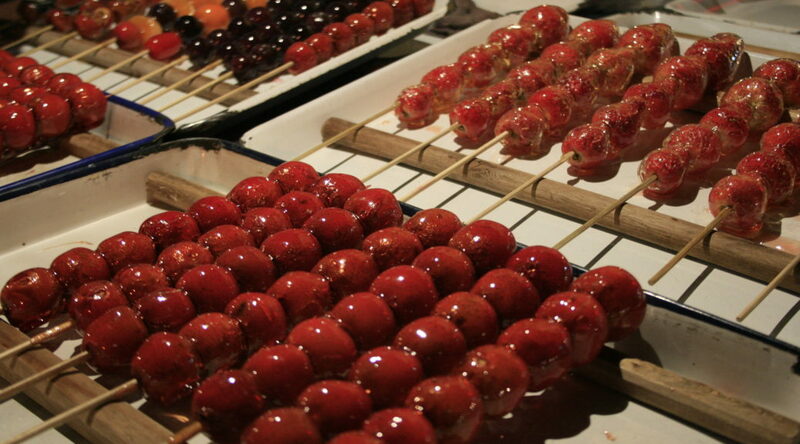 It is made by several candied Chinese hawthorns on a bamboo skewer. Hulu means the bottle gourd in Chinese but here it refers to all small, round fruits used to make this kind of snack. It is commonly sold in winter, which is the reason why Iced Tanghulu is the other name, since the sugar cover is cold in winter. If Tanghulu is made in summer, the sugar cover will be sticky and impair the taste of it. Tangulu is considered as a northern Chinese cuisine originally, but later it was sold all over China. In the past, the vendors put the Iced Tanghulu in a cart or carrying pole, and they would peddle along the street. The child gathered around the vendors to purchase Tanghulu. Contemporarily, some manufacturers also have their own shop to sell the Tanghulu instead of peddling. The Chinese hawthorns are put together onto a bamboo skewer. Then the skewer is immersed into the sugar syrup so that the whole skewer and hawthorns can be covered with the syrup. The cover of sugar will get hard after the skewer is took out from the syrup. Alternatively, the hawthorns can be replaced by other fruits. The contemporary view the origin of Tanghulu is Liao Dynasty, but there are also some folk stories depicting the history. It is said that Consort Huang (the most favorite concubines of the emperor) got heavily sick and the royal doctors could not treat her. The Emperor Guang of Song dynasty inquired in the whole country and one doctor from the outside of palace succeeded in curing the Consort. He asked the consort to eat hawthorns with candies. Later, the method became prevailing in folk and was called as Tanghulu.